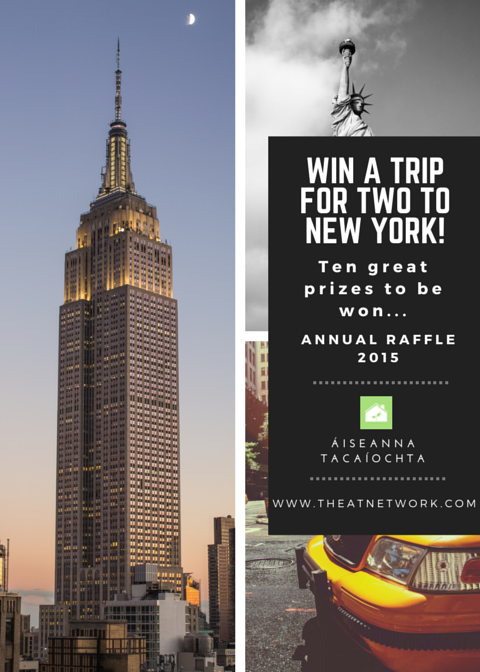 Win a trip for two to New York with our Annual Raffle 2015! We’re very excited here in Áiseanna Tacaíochta (ÁT) to launch our Annual Raffle 2015! You could be in with a chance to win a trip for two to New York, along with nine other fantastic prizes up for grabs. Tickets cost just €2 each or €15 for a book of ten, with the draw taking place on Friday, 18th December 2015. This year, we’re hoping to raise up to €100,000 through the raffle, with every euro going to support people with disabilities to live independent lives in their own communities. Volunteers will be out across the country over the next couple of months to sell our tickets for the raffle, but you can get them at any time that suits you. Just give our Raffle Coordinator, Audrey Brodigan, a call on 085 121 1559 or email audreybrodigan@gmail.com to find out more. Equally, if you’d like to volunteer as a ticket-seller, we’d love to hear from you (and we’ve got some great sellers’ prizes lined up as well); just get in touch with Audrey to find out more! Want to know more? Click here for further details on our Annual Raffle 2015.